A European army. A superstate. A new European government. European Union leaders are constantly calling for these things. In March, French President Emmanuel Macron wrote an article for publication in newspapers across all 28 EU member states calling for more Europe. More Europe means more power. 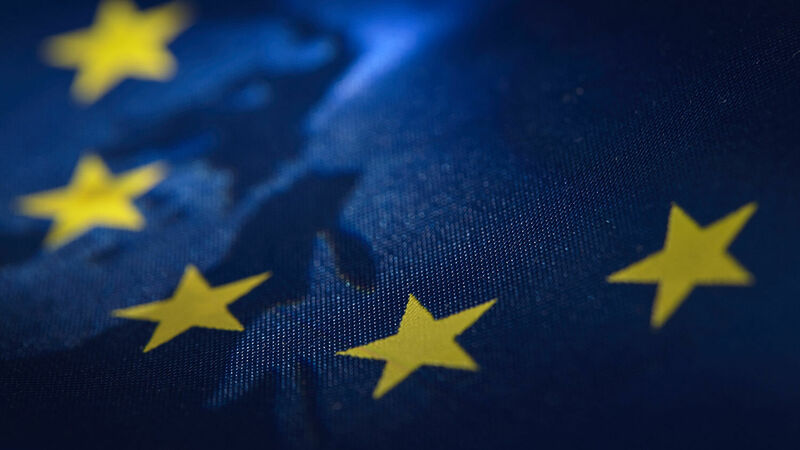 If successfully combined, the EU would have the world’s second-largest economy and second-largest military budget. But would this be a good thing? Would the EU be a force for good in this world? To many, the answer is an obvious yes. A renewed, reinvigorated Europe could be a powerful United States ally, upholding Western values like freedom, the rule of law and democracy. If Europe stopped kowtowing to the world’s dictators, and if it began standing up for itself against radical Islam, the world would be a much better place. Hand in hand with this rosy view of Europe’s future is a rosy picture of Europe’s past. The Greeks invented democracy, we tell ourselves. Rome invented the rule of law. The Roman Empire ushered in peace, prosperity and progress. Life was good—until Rome fell. Then we reached the Dark Ages, a time of violence and barbarity. Human progress stopped. The world was only illuminated for brief periods when European rulers attempted to resurrect the Roman Empire. Then came the Enlightenment. Free thinkers across Europe invented freedom as we know it today. Britain developed those ideas, America put them into practice with a radical new government based on these ideals. With that perspective on the past, it seems obvious that a united, self-confident Europe, built on historical values would be a force for good in the world. But what if this view of history is horribly, horribly wrong? Supporters of European unity should be careful what they wish for. There are a lot of admirable things in Europe’s history: great men, wonderful works of art, and other political and cultural accomplishments. But this standard view of history overlooks a lot of darkness. Take Rome. America’s Founding Fathers admired the Roman Republic. They named the Capitol and the Senate after their Roman predecessors. Around half of these men understood Latin and drew heavily from Roman history. But all this hides a darkness in Rome’s heart. This was a society where humans watched other humans fight to the death as entertainment. Where a baby didn’t count as human until accepted by his father. If rejected, the parents would “expose him,” leaving the baby to die of exposure in a rubbish dump. Archaeological excavations confirm that this practice was chillingly common. If the baby was lucky, he would be rescued—by slave traders, eager to profit from the republic’s insatiable demand for captive labor. The number of slaves in Italy by the first century b.c. is estimated at 20 to 40 percent of the population (at least 1.5 million people). In later times, the empire was supported by a workforce of around 5 million slaves. When it treated its children and its slaves like this, it is no wonder that Rome was brutal to its enemies. The Roman Republic became a superpower in the second century b.c. with two acts of shocking brutality. Carthage had been Rome’s great rival for rule of the Mediterranean. In 216 b.c. the Carthaginian Hannibal defeated the Romans at Cannae, leaving the entire republic vulnerable. Rome barely survived, but over the course of the 17-year-long war, it ultimately beat Carthage. Roman soldiers utterly destroy Carthage. This became a foundational doctrine of Roman power: punishment through citywide destruction. By 146 b.c., this was old history. Carthage was no longer a threat. But Rome decided that Carthage had to be destroyed. The legions were ordered to leave no building standing and leave no person alive. It took nearly a year, but the once-great Carthage was systematically, carefully, literally wiped off the map. Carthage was not the only major Mediterranean city Rome destroyed that year. Greece at the time was under the protection of Rome. Corinth continued to squabble with other Greek cities as it had always done. To Rome, this was defiance. Corinth was the richest city in Greece at the time. It was famous across the Mediterranean for its art and culture, as well as its seedier entertainments. In 146 b.c., Rome wiped it out. Every man was killed. In a city famed for its prostitutes, the women were not killed, but enslaved, as were the children. The story of Corinth’s destruction echoed around the world. This became a foundational doctrine of Roman power: punishment through citywide destruction. If the Romans had had nuclear weapons, they would have used them, achieving the same effect with much less manpower. This was all before Rome even became an empire. Some of the most detailed accounts of the brutality of Rome’s expansion come from Julius Caesar’s conquest of Gaul a century later. Caesar expanded the borders of Rome, refounding both Carthage and Corinth and eventually helping transform Rome into an empire. But as he conquered the land that is now France during the Gallic Wars, about a million Gauls were killed and another million taken as slaves. When anyone defied or upset Rome, the response was crushing force. When the Jews rebelled, the Romans massacred tens of thousands of them in a.d. 70. Eventually they wiped the very names of “Jerusalem” and “Judea” off the map. Josephus put the death toll at a million, with another 97,000 carried off as slaves. None of this erases the achievements of Rome. But it gives them their proper context. Pax Romana—peace under Rome—certainly existed. But it was enforced by brutality. The western Roman Empire fell in the fifth century. In the east, it lingered as the Byzantine Empire. In a.d. 527, this flagging empire received a breath of new life under Emperor Justinian. Generally, the Roman Empire cared little for the religion of its subjects, with the exception of periodically persecuting Jews and Christians. Emperor Constantine had converted to Catholicism 200 years earlier and begun Rome on the path to a theocratic state. But under Justinian, the Roman Empire fully embraced the state religion—and the persecution of dissenters. Byzantine law stated that Christians who did not conform to the Catholic Church should be “driven outside the walls of the city with relentless violence.” Non-Catholic places of worship were eradicated as far away as North Africa. As part of this mission, Justinian reconquered Rome, restoring the empire in the West. But he could not hold on to it for long. After his death, the empire shrank back. The next to revive Rome was Charlemagne. Charlemagne ascended to the Frankish throne in a.d. 768 and quickly formed a partnership with the Catholic Church. The pope legitimized his rule by preaching that he was the rightful king of the Franks, and later, Holy Roman emperor. In return, Charlemagne supported the pope with his military. 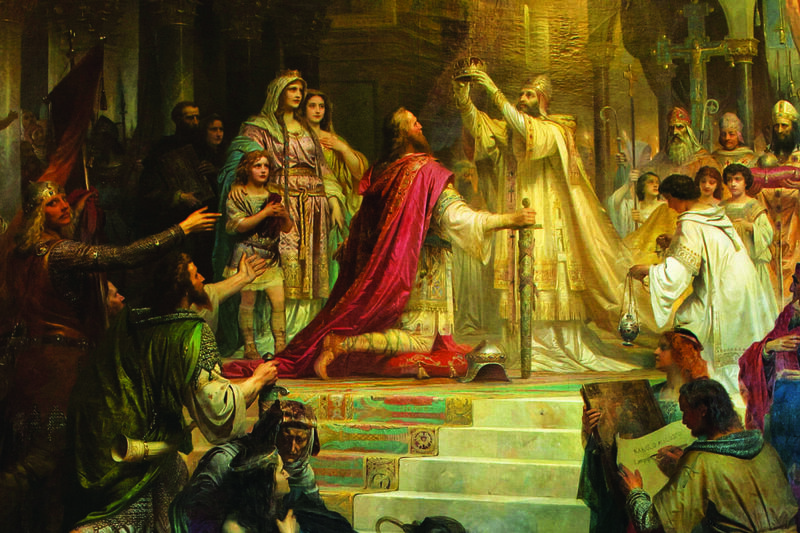 The pope crowns Charlemagne as Holy Roman emperor. The blood that flowed was not only spilled in battle. After one rebellion, Charlemagne executed thousands of prisoners. Entire tribes were forcibly relocated. Even some of Charlemagne’s advisers questioned the degree of bloodshed he inflicted. Charlemagne was born a warrior. Holland discusses Charlemagne’s view of himself as a new David, the head of a new chosen people with the sanction of God: “It was in the perfect consciousness of this that Charlemagne made the wastes of Saxony to flow with pagan blood; that he spread even among the barbarous Slavs who swarmed on the outer reaches of the world awful rumors of the wrath and terror of his name; that he returned every autumn from his campaigns with lumbering wagon trains of booty, spoils with which to strengthen the Christian order throughout his vast domains” (ibid). He imposed Catholicism on all he could reach. Refusal to be baptized meant death. So did following the old pagan religions, holding unauthorized religious meetings, and eating meat during Lent. “Not since the age of the Caesars had atrocities been committed on quite so imperious a scale—and never before with the goal of imposing the love of Christ” (ibid; emphasis added). The empire fell apart after Charlemagne died. But in 955, Rome was again resurrected. This time it was the Saxons themselves, now thoroughly converted to Catholicism, who provided the emperor, Otto the Great. In Otto’s empire, “it was taken for granted that warfare might be a Christian’s ultimate duty,” writes Holland. And the character of the empire remained the same. Catholic enemies of the empire could expect some clemency. But when he defeated the pagan Magyars at the Battle of Lechfeld in 955, Otto took no prisoners except high-ranking nobles. It was custom in those days to ransom and return captured princes; instead, Otto publicly executed them. 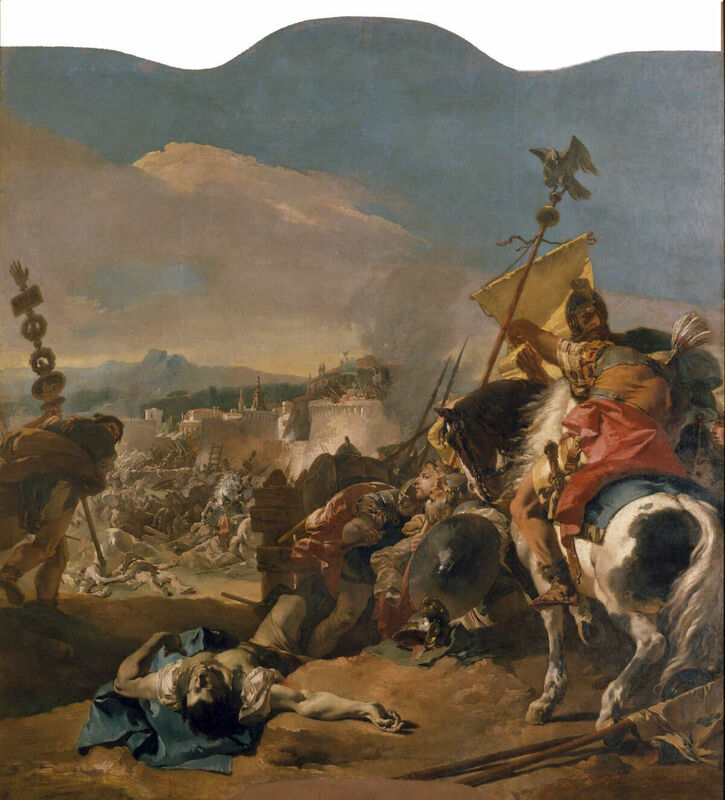 Shortly afterward, Otto defeated the pagan Slavs at the Battle of Recknitz. He executed all the prisoners. These two savage battles cemented Otto’s rule. During the reign of Otto’s descendants, the Catholic Church launched the Crusades, a series of bloody wars designed to retake the Holy Land. Millions of people died. Although they are perhaps the best-known examples of Catholic bloodshed, the Crusades were just part of a much longer, larger, bloodier pattern over the past two millennia. The Habsburg Dynasty succeeded Otto’s dynasty to lead the Holy Roman Empire. Under the Habsburgs, the Holy Roman Empire reached its largest territorial extent. Maximilian i was one of the first of these rulers to reach prominence. Under his son, Philip, Spain conquered most of the New World. The Catholic Church poured into the newly conquered territories. Though they are impossible to verify, contemporary reports claim the Franciscans alone baptized 5 million people—roughly 1 percent of the world population at the time. Newly introduced diseases wiped out large numbers of the conquered, but the Spanish and Portuguese conquerors also committed massacres—and documented them. “Through a combination of ruthlessness that stands comparison with the great Mongol invasions across Asia, [Hernán] Cortés and his men seized the Aztec treasures, pillaging ‘like little beasts … each man utterly possessed by greed,’ according to an account compiled in the 16th century from eyewitness testimonies” (The Silk Roads). He brought Catholicism back to secular, post-revolution France and restored many of its privileges, as well as the church’s role in education. In return, he received the church’s support. Of course, the Aztecs do not make sympathetic victims. The Spanish were wiping out a civilization built on slavery and human sacrifice. But the point is, the pattern of European butchery continued. Meanwhile, there was plenty more Catholic butchery back home. The Protestant Reformation had begun, and the Habsburgs took the lead in combating it. The empire killed or drove out Protestants, Jews and Muslims from Spain. Wars of religion broke out repeatedly. The persecutions and wars of this period killed an estimated 50 million people. 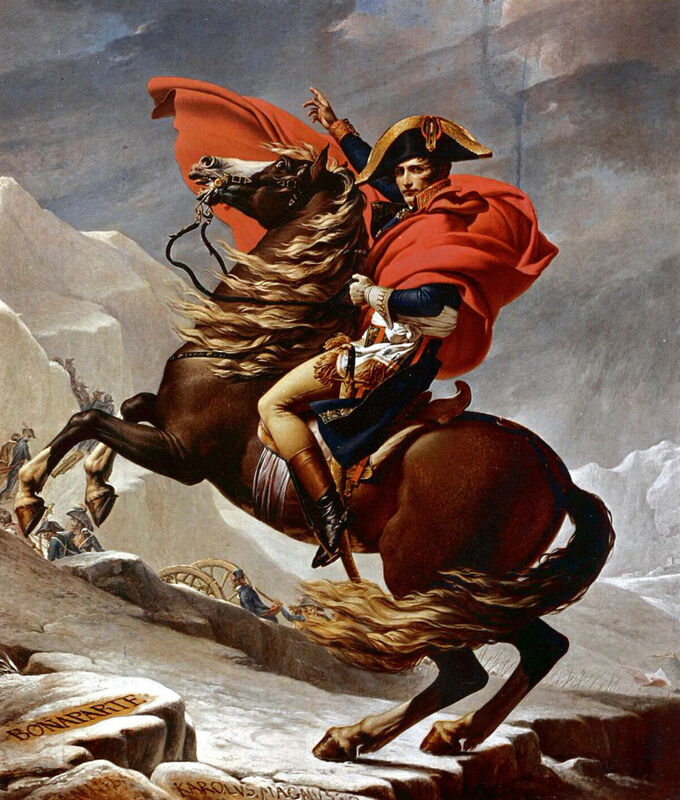 Napoleon was the next to try to resurrect the Roman Empire. His armies marched under standards depicting Roman eagles. He consciously modeled himself after Julius Caesar. After initially opposing the Catholic Church, he cut a deal with it. He brought Catholicism back to secular, post-revolution France and restored many of its privileges, as well as the church’s role in education. In return, he received the church’s support. In his bid to take over Europe, Napoleon launched war after war. Credible estimates of the total death toll put it around 5 million. Napoleon was callous about death, even the deaths of his own countrymen. After the Battle of Austerlitz, when one general lamented the number of French dead, Napoleon replied that “the women of Paris can replace those men in one night.” In 1813, when Austrian Foreign Minister Klemens von Metternich warned Napoleon about the human cost of continuing to fight, Napoleon said he would gladly sacrifice a million Frenchmen to gain his ambition. At Waterloo in 1815, Napoleon faced another battle with a terrible death toll—and it was his last. The next attempt to resurrect Rome needs little explanation. Adolf Hitler and Benito Mussolini modeled their rule after the Roman Empire, and both signed the same kind of deals with the Catholic Church. The death toll resulting from this adventurism was some 60 million. World War ii may seem like an aberration in European history, but in truth, it was the continuation of 2,000 years of European history. The history of Europe is a history of a church allying with a military power, lifetime after lifetime, century after century. So what does the Bible have to say about this? The Bible actually contains specific prophecies about the rise of this power and the role of this church. In the book of Daniel, God gives an overview of thousands of years of world history. These prophecies describe historical figures like Alexander the Great; prophecies so accurate and clear that critics insist they must have been written after the events occurred. But the book also describes the empire that followed Alexander. Daniel 7:7 describes a symbolic beast that is “terrifying, dreadful, and very strong. It devoured and crushed its victims with huge iron teeth and trampled their remains beneath its feet” (New Living Translation). This is an excellent description of a power that defeated Carthage, then returned 50 years later to grind its last remains into dust. Verse 23 states that this beast will “devour the whole world, trampling and crushing everything in its path” (nlt). This is a prophecy of the Roman Empire. Describing the world powers listed in Daniel 7, Trumpet editor in chief Gerald Flurry writes, “These are dreadful beasts that conquer and enslave entire nations. It’s what these beasts do.” However, he continues, Britain and America like “to think of them as harmless wild animals. … They fear to face the extremely unpleasant truth” (Daniel Unlocks Revelation). God describes this fourth beast of Daniel 7 as having 10 horns. These, the Bible says, “are ten kings [or kingdoms] that shall arise” out of this beast (verse 24). For a time, this beast ruled the world. But then would come 10 more resurrections of that empire. 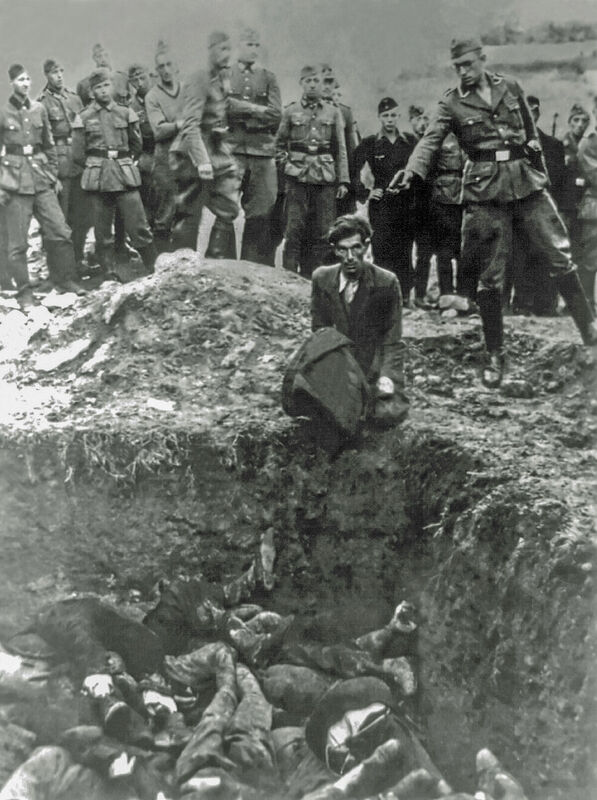 A German soldier prepares to kill a Jew in Ukraine in 1941. Yes, Europe is the home of some of humanity’s greatest achievements. But it is also the home of some of humanity’s worst atrocities. “I considered the horns, and, behold, there came up among them another little horn, before whom there were three of the first horns plucked up by the roots: and, behold, in this horn were eyes like the eyes of man, and a mouth speaking great things” (verse 8). This little horn “shall rise after them; and he shall be diverse from the first, and he shall subdue three kings. And he shall speak great words against the most High, and shall wear out the saints of the most High, and think to change times and laws …” (verses 24-25). Mr. Flurry describes Daniel 7:8 as “the single most revealing verse in the book of Daniel.” This “little horn” refers to a great false church. The first three “horns” that resurrected the empire were the barbarian tribes that conquered Rome: the Heruli, the Vandals and the Ostrogoths. But they were “plucked up” by the Catholic Church when, in a.d. 554, Justinian’s Byzantine Empire established a relationship with the Catholic Church and reconquered Rome. The subsequent resurrections of the Roman Empire followed that pattern of combining Catholicism with political and military power. That church went on to “change times and laws,” influencing empires for centuries to come, to the point that to this day we still use the calendar devised by Pope Gregory xiii. Daniel 7 gives us this crucial overview of European history. Justinian’s Imperial Restoration, the Frankish Kingdom, Otto the Great, the Habsburg Dynasty, Napoleon, Hitler and Mussolini: The Catholic-European empire has arisen six times. Today, the world sees modern, sophisticated, largely secular Europe as a cultural and economic power, not a military or religious power. We certainly do not consider it the power bloc likeliest to instigate massive bloodshed. We look on the European Union’s efforts to integrate as a curiosity with limited ramifications. This history sounds a warning about Europe’s modern efforts to integrate. Yes, Europe is the home of some of humanity’s greatest achievements. But it is also the home of some of humanity’s worst atrocities. “The art of Europe, immanent and transcendent, the philosophy and the politics, all have taken humanity to a place it has not been before,” George Friedman writes of 1913 Europe. “To many, it seemed as if they were at the gates of heaven …. No one expected this moment to be the preface to hell. In the next 31 years, Europe tore itself apart …. Other civilizations have undergone turmoil, war and slavery. But the unexpectedness, the intensity, the rapidity and the consequences for the entire world were distinctive …. [T]he connection between European high culture and death camps is surprising at the very least” (Flashpoints: The Emerging Crisis in Europe). This paradox was not a one-off. The Habsburg emperors helped kill huge numbers of non-Catholics. “They did their killing while supporting artists like Mozart, Bach and Schubert,” writes Mr. Flurry, “they were very sophisticated as they slaughtered people” (op cit). Two thousand years of history sound a powerful warning on the future of Europe. A strong, united European power with modern technology has global implications. History teaches that modern Europe is actually a threat. The Bible prophesies it. But the Bible also adds great hope to the warning. The God who in the 500s b.c. described the next 2,500 years of human history so accurately has a powerful mind and incredible power. And He gave His prophecies for our benefit. We are now living in the time of the final horn, the last king of this Holy Roman beast power. The next major event in history is the return and rule of Jesus Christ—the true Christ, not the one the false church claims to worship. Daniel 7 also details the reason God allows this church-state empire to repeatedly instigate mass bloodshed throughout history. In fact, the focus of the chapter is not on the terrible beast powers, but on what happens after they are finally gone. 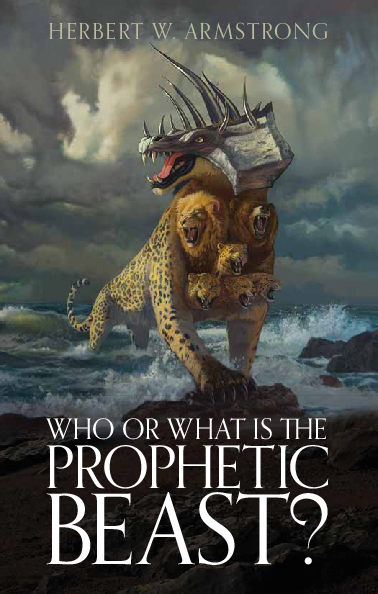 It says the thrones of these beasts are “cast down.” In their place, “one like the Son of man” receives “dominion, and glory, and a kingdom, that all people, nations, and languages, should serve him” (verses 9, 13-14). God allows this beast to crush the world one last time. But all this has a hugely positive purpose: “These events were designed to crush all hope man has in himself—and turn him to hope in God,” writes Mr. Flurry (ibid). Man’s history is not a long march of self-improvement, centered in Europe or anywhere else. Only when man’s efforts to trust in himself have proved a total and destructive failure will man willingly listen to and submit to God. Once that happens, a wonderful world, free of this kind of destruction, is coming. This is where man’s history is leading—as foretold and brought about by Almighty God.